To find out more, email Miri Belnikoff with your CV and cover letter. GIFT are looking for a motivated and proactive YOUTH VOLUNTEER COORDINATOR to recruit and nurture GIFT’s volunteers and recipients. Ideal for someone whose passion is to make a difference and has a strong sense of social responsibility. An exciting opportunity has arisen for someone with strong commitment, inspiration and drive to lead our youth and student teams. The ideal candidate will have a high level of understanding and experience of progressive Jewish life and practices. Reford Judaism & RSY-Netzer are looking for a Director, with the experience and determination to support and lead their Youth and Students teams in developing sustainable strategies for the future. FZY are looking for a passionate and experienced individual to work as a sabbatical movement worker, with responsibility for writing, coordinating and running educational sessions, residential seminars and summer activities for FZY members aged 11-25 years old. CCJ is seeking to appoint a full-time Jewish Programme Manager to work alongside their Christian Programme Manager to deliver innovative and high quality projects which contribute towards positive relationships between Christians and Jews in the UK. FZY are looking for a passionate and experienced individual to work as the Diller Teen Fellows Programme and a Project Manager with responsibility for overseeing an immersive educational programme for teenagers, and to manage a further FZY project. 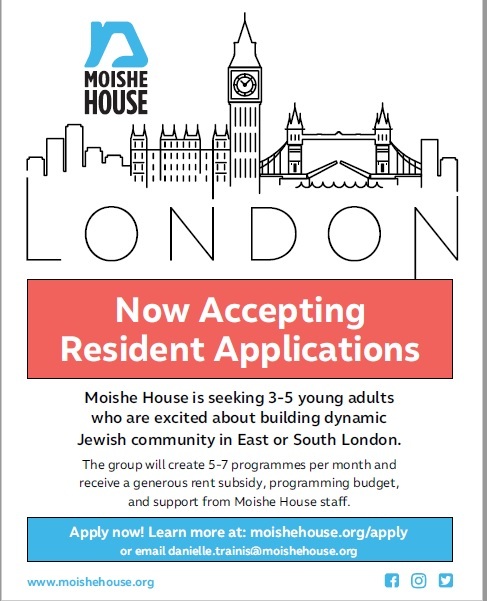 Are you Jewish, aged 18-30 and do you have a university degree? Masa Israel Teaching Fellows aims to advance the Israeli student’s English skills is schools throughout Israel by placing them with dedicated and passionate college graduates. English language skills are key indicators in higher education and beyond. There is a stipend on 2,500 shekel for non-qualified teachers and 5,500 shekel for qualified teachers. Masa Israel Teaching Fellows aims to advance the English communicative skills of Israeli students throughout the country. Masa Israel Teaching Fellows operates in cities around Israel. Each city cohort is operated by a program provider that arranges housing, liaises with your schools, provides extracurricular programming and manages your day-to-day needs. The Fellowship runs from late August to June each year, with applications opening in the fall for the next year. Learn more about the details.